Maya Quintanilla was born at 6.58am on 12/08/16 weighing 3170g and measuring 51cm long. If you would like to read all about the birth you can read my personal blog here. Adjusting to life as a mum has definitely been a roller coaster ride and my pregnancy insomnia sure was getting me ready for these sleepless nights! 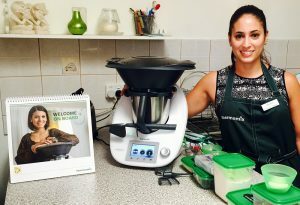 But I am loving every minute and I am so grateful to have my Thermomix by my side. 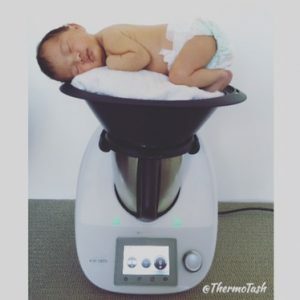 And now that hubby is back at work I don’t have to worry about burning food on the stove because the Thermomix will do the cooking for me. Which means I can just focus on spending every precious moment with my new baby girl. 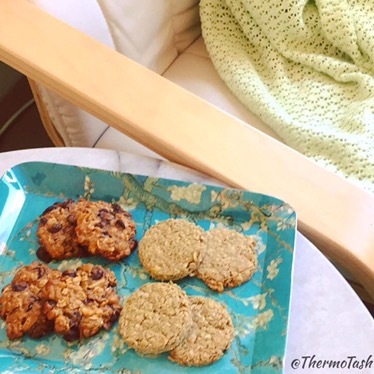 I love using the Thermomix Recipe Platform (now Cookidoo) to do my meal planning and create my shopping lists – which I can just email to hubby to buy on his way home. 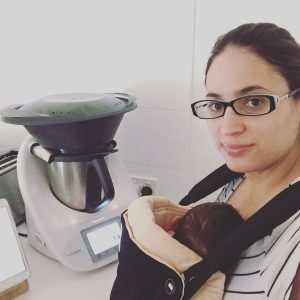 And now that we have established breastfeeding and Maya has had her 6 week vaccinations we are ready to leave the newborn home bubble and get started with a healthy eating and exercise routine. It has been hard adjusting my diet to anti-colic foods. No cauliflower means no Skinnymixers carbonara! 🙁 And it’s been even harder to not give into the chocolate cravings at night. Thank god for the Almond and Date slice from the Vegetarian cookbook! So yum!